You might have seen this image in a luxury magazine or even at a fancy hotel or lodge: a spacious room with natural textiles and a fireplace with a warm, blazing, inviting fire. And above the fire place, a massive flat screen television mounted on the wall. It might seem like such gorgeous—even practical—idea for your own home, but there are actually a few reasons why you might not want to consider doing so. After all, electronics already generate enough heat on their own; and when they generate too much heat and cannot dissipate it they overheat; and if they overheat too often, they will break. So why would you want your oversized HDTV to reside very close to anything else that generates a lot of heat? In addition, the smoke that emanates from the fire can collect inside the electrical components of your HDTV and, over time, that can affect how the machine distributes and reacts to heat, reducing its lifetime, more than likely. One of the best benefits of installing a wall mount for big screen tv at Primecables.com is that you can move your set to suit the best viewing angle according to your seating. LCD screens (like those of HDTVs, laptops, tablets, phones, etc) have a limited viewing angle because they are actually built of tiny windows that open and close, “emitting” light from the back to create the image you see. And they are designed to be viewed at a specific and direct angle. Let’s just say that the angle from your couch to the television over the fireplace is not the optimal one. 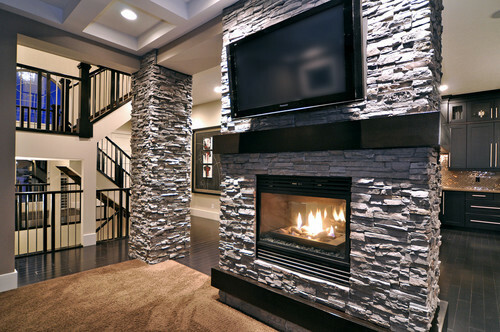 Also, if you mount the television over the fireplace, then, you will be persistently looking upwards at it. This is, literally, a pain in the neck. But more importantly, it really is not as pretty as it looks in the magazine. Or, more specifically, it might look awesome in the photo, but it has probably been staged with the room outfitted by a professional decorator. And the HDTV looks fine when it is not powered on—have you ever actually seen what it looks like when an HDTV mounted over a fireplace looks like while trying to watch an action movie or the news? Besides, you really wouldn’t want to light your television from beneath—that is confusing for your eyes.